Facebook Mother’s Day Golden Gift Voucher Giveaway! Friends Summer Bring a Friend Free Offer 2019! First time to Ragdale Hall? Instagram Mother’s Day Golden Gift Voucher Giveaway! Twitter Mother’s Day Golden Gift Voucher Giveaway! Prepare for Christmas Shopping Week Extravaganza! Boutique Fashion Buyer, Debbie Lindfield gives you a preview of this season’s new ranges now in the Boutique. New Boutique – coming soon! New additions to the relax@ragdale range! Are you one of the 70% of women wearing the wrong size bra? Meghan Markle loves Pilates – why not give it a try?! Dance, relax, repeat. It’s the Dancercise break! A Foodie Lover’s Spa Break…Healthy Food, Tasting Good! Back to school means lessons all round! When love is in the air, choose the perfect Romantic Getaway! Say thank you this Mother’s Day with the gift of pampering! RELAX…we tell you how with a relaxing break! Pilates or Yoga? That is the question! All things lovely and English…. A healthy break that suits you! Fancy doing something different for Christmas this year? Healthy French Cuisine – ooh la la! Five-day £100 Golden Gift Voucher Giveaway! We’ve done it again! TripAdvisor rate us ‘Excellent’ for eighth year running! It’s game, set and match to Ragdale! Experience our NEW Rooftop Infinity Pool – WATCH NOW! Vote for Ragdale Hall and you could win a spa break! How far would you travel to visit Ragdale Hall? Senior team members celebrate 25 years! Love alfresco dining? Then you’ll love this! The all new Beauty Shop is open! Ragdale Hall’s owners celebrate 25 years! Excellence Hall of Fame for Ragdale Hall! Candis Best Dedicated Spa means a hat trick for Ragdale! The Ultimate Day is here – exclusively at Ragdale Hall! Ragdale Hall – a home from home! The Ragdale Hall Dining Room has had a make-over! See our new developments for yourself! Ragdale Hall is celebrating 40 years as one of the UK’s leading spas! Twenty One Healthy & Happy Years! Ragdale Hall’s Unique Mind Gym…. Kick-start 2019 with a brand-new YOU! Get wet and get fit with our NEW water exercise classes! We’re a UK Top 5 Fitness Retreat! It worked for Janet…could it for you too? Ragdale Hall’s MD wins Triathlon World Championships SILVER medal! Brave Charlotte is preparing to take on the world! Meet Martin Carter – our NEW Executive Head Chef! Top chefs flip-out at their pancake challenge! Ragdale Recommends: Get your skin ready for Spring! Keep calm, exam season is over! Meet our new Holistic Team! Ragdale shortlisted in Natural Health magazine’s International Beauty Awards 2018 – vote for us! NEW Decleor Yoga Lift Facial! NEW – give roots the boot! Clarins’ first salon eye treatment is here! Calling all brides-to-be in need of a pre wedding pamper! 40 years of spa treatments! The Beauty Express is now open! Ragdale Hall ‘Relax’ spa product range in M&S stores! Ragdale Hall’s hot tips this autumn! Aura by Swarovski is here! Spas – why the “s” words are so relaxing! Skincare tips from Decleor and Ragdale Hall fit for Royal skin! To all you Clarins lovers…read on for what’s new plus great Mothers Day gift ideas! What will the new NEOM scent inspire you to do? Spring weekend breaks in the UK: relax or keep fit – or both! In search of quality time? Book a spa holiday! Is there something frightening you? Keeping your skin young: an age-old fight? Cheers to 20 years, Kerry! Student of Excellence 2019 entries now open! Celebrate exam results in style! 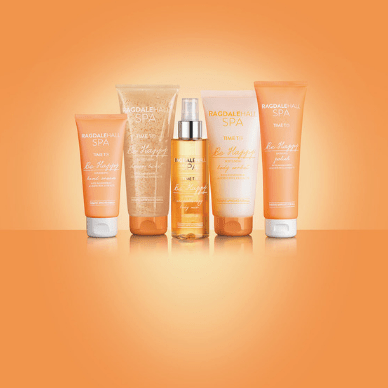 M&S launch NEW Ragdale Hall Spa Time To…Be Happy Collection! Top UK trainer keeps our Fitness Team motivated! Student of Excellence 2018 – and the winner is….! The NEW Rooftop Infinity Pool is open! Could you be our next Student of Excellence? We’re a Good Spa Guide 2017 Five Bubble Spa! Eighty years old – and 41 years of visiting Ragdale Hall! From work experience to long service awards! Did you find a Ragdale spa gift under the tree? Festive Food – how to eat, drink and still be merry! What’s it really like to join our team of therapists? Spa breaks just got better! Father’s Day – we have the answer! 5, 4, 3, 2, 1…Ragdale time! Keeping it clean – and green! Our most popular bedrooms get a new look! THE venue for luxury fitness breaks……. Recognised for being the best, by the best! When love is in the air…..choose the perfect romatic getaway! Help us win by voting online! Like mother, like daughter – a spa break you’ll both enjoy! Ragdale wins another International award! Planning a day out with the girls? Coming soon…our very best offers of the year! The Spa Traveller awards – we are finalists! Do you want stress free exams? Avoid paying single rates when visiting alone…. Spa breaks – the ideal antidote to festive excesses! Could “rational thinking” solve the nation’s weight problems? Hands up all those in favour of spa treatments! O.P.I. Luxury Manicure – now includes Pro-Spa products! ELEMIS BIOTEC Anti-Wrinkle Eye – video available!